O God, who didst inspire blessed John, thy Confessor, with an ardent love of perfect self-denial and of the cross, grant we may so follow his example, as to obtain everlasting glory. Through our Lord Jesus Christ, thy Son, who liveth and reigneth with thee, in the unity of the Holy Ghost, God, world without end. Amen. 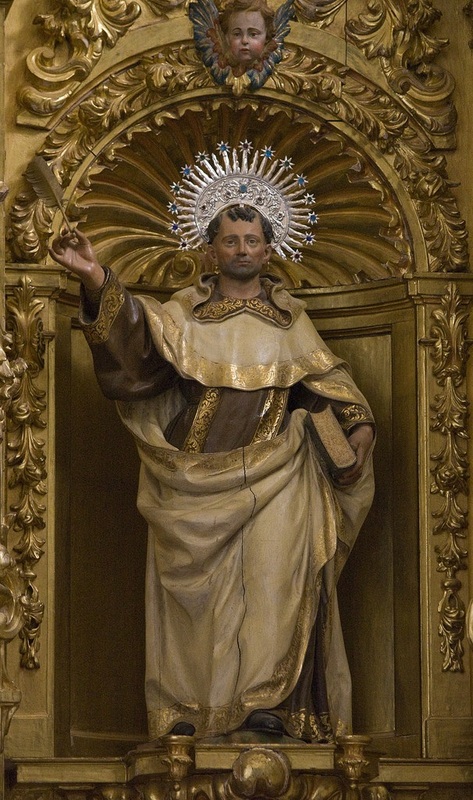 In 1542, was born at Fontiveros, a hamlet of old Castile, St. John of the Cross, renowned through the entire Christian world, as the restorer of the Carmelite Order. His mother, after his father's early death, went to Medina del Campo, where John commenced his studies, and continued them until he entered the order of the Blessed Virgin of Mount Carmel. From his early youth he had entertained a child-like devotion to the Blessed Virgin, who more than once saved him most miraculously from death. One day, when playing with some other lads around a deep pond, he fell into it. In this danger, the Divine Mother appeared to him in a most beautiful form, and offered him her hand, to draw him out of the water. But as his hands were much soiled, he hesitated to take those of so brilliant a lady; whereupon his Guardian Angel, or some other inhabitant of heaven, held out to him from the edge of the pond, a long pole, by the aid of which he was happily saved. At another time he fell into a well, and when all feared that he was drowned, they saw him sitting quietly upon the water. When they drew him out, he said that the Queen of Heaven had caught him in her cloak, and thus prevented his sinking. Before he was nine years old, he showed a wonderful zeal in mortifying his body, chastising himself by taking only a short rest on a hard bed, and by voluntary fasts. While yet a student, he nursed, with great solicitude and charity, the sick in the hospitals. After he had taken the Carmelite habit, he was not satisfied with the penances then practised in the convent, but endeavored to regulate his life in accordance with the first rules and ancient austerity of the Order. When he prepared himself to say his first holy Mass, he searched his conscience very carefully, but found no grievous fault. He then gave humble thanks to the Almighty, and during his Mass, begged for the grace to be kept in future free from all mortal sin. His prayer was accepted, and he heard the words: “I grant thee thy wish.” From that time St. John never offended the Lord by a mortal sin, nor voluntarily by a venial one. St. Teresa, who lived at that period, said of him that he was a Saint, and had been one all his life. This renowned and holy virgin met St. John at Medina, and conferred with him about her desire to found houses for religious, who would live according to the original strict regulations of the Carmelites. John, who, in his eagerness to live in greater austerity, had thought of joining the Carthusian monks, asked St. Teresa's advice. She told him that it would be more agreeable to God, if he remained in his Order, and restored among the men the same primitive rigor which she was endeavoring to restore among the women. She added, that God had called him to this work. John took counsel with God and his confessor, and then resolved to follow St. Teresa's advice. He erected his first monastery on a farm which had been presented to him for this purpose; and God so visibly blest his undertaking, that he not only filled his house, in a short time, with zealous men, but was enabled also to found several other convents. In these religious houses, all the inmates lived so holy and so austere a life, that many thought it was more to be admired than imitated. The Saint was an example to all, and one could hardly imagine a penance which he did not practise. He gave no ear to those who told him to moderate his severities, but said: “The narrow path leading to heaven cannot be travelled by me in a manner less austere.” The hardships he endured in founding his monasteries, and in restoring the severe regulations of the Order; the persecutions and wrongs he suffered, cannot be described in the short space allotted to us; yet in all these trials he was never despondent. The love of God possessed his heart so entirely, that he desired nothing but to labor and to suffer for His honor. The Lord asked him one day what recompense he desired for all his trouble and labor. “Nothing else, O Lord, but to suffer and to be despised for Thy sake,” was his answer. Three things he used to ask of the Almighty:—first, much work and much suffering; secondly, not to depart this life as a superior; thirdly, that he might live and die despised. So unusual a desire to suffer and to be despised, was the result of his meditation on the Passion of Jesus Christ, and of his great love to God. This love was so intense, that his countenance was frequently seen radiant with a heavenly light, especially when he spoke of divine things. At the time of prayer, as well as during holy Mass, he often fell into ecstasy and was dissolved in tears. Our Lord once appeared to him in the same form as when He died for us on the Cross. This picture remained so indelibly imprinted on the Saint's memory, that it almost daily drew tears from his eyes. Into all those over whom he had the slightest influence he endeavored to instil a tender devotion to our crucified Lord, as well as to the Most Holy Trinity and to the Blessed Eucharist. His language to sinners was so forcible, that he converted even the most hardened. He was much aided in this by the gift which the Almighty had bestowed upon him, of reading the thoughts of the heart. Many who came to him were reproached with their secret sins, and admonished to reform their lives. He possessed also the gifts of prophecy, of driving out devils, and curing all kinds of diseases. Besides this, he had many visions of the Blessed Virgin, St. Joseph, St. John, and Christ the Lord. Especially remarkable were the heavenly favors with which this great servant of the Almighty was comforted during an imprisonment of nine months, to which he was unjustly condemned. Christ appeared to him and said: “Behold! John, I am here! Fear not. I will rescue thee!” The Blessed Virgin, accompanied by a great many Saints, appeared to him, and said: “My son, be patient and endure; for your trials will soon give way to joy.” In another vision, she admonished him to escape from the prison, promising him her assistance; a promise which she also kept. St. Teresa, who, during her life, had been closely united with him, appeared also to him after her death, speaking to him most kindly. In his adversity she comforted him, and encouraged him to new labors for the honor of God. The reward of all the work which the holy man had accomplished, as also of the trials and tribulations he had suffered, was at length bestowed upon him, in the year 1591, when he was in the forty-ninth year of his age. He was seized with fever, in the hermitage of Pegnuela, and was brought from there to Ubeda, according to his wish. He had an ulcer on that part of his right foot where the holy feet of our Lord were pierced with nails. To open it, the surgeon was obliged to make a deep incision. The pain thus caused was very great; but greater still was the patience of the Saint, who even rejoiced at bearing, in some manner, the image of the sufferings of Christ, and at having five wounds on one foot. God had already, some time previously, revealed to him the hour of his death; and the Blessed Virgin, whom the Saint had always especially honored, appeared to him on the eve of the Immaculate Conception, saying that she would come for him on the Sunday after the festival. When the physicians told him that his end was not far distant, he said, in the words of the Psalmist: “I was glad when they said unto me, We shall go up into the house of the Lord.” Half an hour before his death, he called all his religious to him, exhorted them to persevere in their zeal, and said: “My parting hour draws near.” After the usual prayers of the Church, he heard the bells ring for the midnight Matins. “I shall sing the Matins in Heaven,” said he; after which, taking the Crucifix, he kissed it most devoutly, and calmly ended his holy life, saying: “Into Thy hands, O Lord, I commend my soul.” A large ball, as of fire, was seen above the dying Saint. After his death, his countenance beamed with a heavenly brightness, and was so beautiful that none grew weary of looking at him; while at the same time such delicious odor emanated from him, that the whole monastery was filled with it. The Almighty has carefully preserved his body incorrupt until this hour. Another account of St. John of the Cross. St. John, by his family name called Yepes, was youngest child of Gonzales of Yepes, and born at Fontibere, near Avila, in Old Castile, in 1642. With his mother's milk he sucked in the most tender devotion to the Blessed Virgin, and was preserved from many dangers by the visible protection of her intercession. The death of his father left his mother destitute of all succours with three little children, with whom she settled at Medina. John learned the first elements of letters at a college. The administrator of the hospital, delighted with his extraordinary piety, employed him in serving the sick; an office which was very agreeable to the devotion of the youth, who acquitted himself with the feeling of charity much above his years, especially when he exhorted the sick to acts of virtue. He practised, at the same time, excessive austerities, and continued his studies in the college of the Jesuits. At twenty-one years of age, to satisfy his devotion to the mother of God, he took the religious habit among the Carmelite friars at Medina, in 1563. Never did any novice give greater proofs of obedience, humility, fervour, and love of the cross. His zeal, far from abating after his novitiate, was continually upon the increase. When he arrived at Salamanca, in order to commence his higher studies, the austerities which he practised were excessive. He chose for his cell a little dark hole at the bottom of the dormitory. A hollow board, something like a grave, was his bed. He platted himself so rough a hair shirt, that, at the least motion, it pricked his body to blood. His fasts and other mortifications were incredible. By these means he studied to die to the world and to himself; but by assiduous prayer and contemplation, in silence and retirement, he gave wings to his soul. It was his desire to be a lay-brother, but this was refused him. He had distinguished himself in his course of theological studies, when, in 1567, being twenty-five years old, he was promoted to the priesthood. He prepared himself to offer his first sacrifice by humiliations, fasts, penitential tears, fervent prayers, and long meditations on the sufferings of our Divine Redeemer; deeply imprinting his precious wounds in his heart, and sacrificing himself, his will, and all his actions with his Saviour, in raptures of love and devotion. The graces which he received from the holy mysteries, inflamed him with a desire of greater retirement; for which purpose he deliberated with himself to enter the Order of the Carthusians. St. Teresa was then busy in establishing her reformation of the Carmelites, and coming to Medina del Campo heard speak of the extraordinary virtue of brother John. Whereupon she desired to see him, admired his spirit, and told him that God had called him to sanctify himself in the Order of our Lady of Mount Carmel: that she had received authority from the general to found two reformed houses of men, and that he himself should be the first instrument of so great a work. Soon after, she founded her first monastery of men in a poor house in the village of Durvelle. John, who had acquiesced in her proposal, entered this new Bethlehem, in a perfect spirit of sacrifice, and about two months after was joined by some others, who all renewed their profession on Advent Sunday, 1568. This was the beginning of the Barefooted Carmelite Friars, whose institute was approved by Pope Pius V, and in 1580, confirmed by Gregory XIII. So great were the austerities of these primitive Carmelites, that St. Teresa saw it necessary to prescribe them a mitigation. The odour of their sanctity in their poor obscure house spread over all Spain; and St. Teresa soon after established a second convent at Pastrane, and, in 1568, a third at Manreza, whither she translated that from Durvelle, and, in 1572, a fourth at Alcala. The example and the exhortations of St. John inspired the religious with a perfect spirit of solitude, humility, and mortification. His wonderful love of the cross appeared in all his actions, and it was by meditating continually on the sufferings of Christ that it increased daily in his soul: for love made him desire to resemble his crucified Redeemer in all manner of humiliations and sufferings. And Almighty God, to purify his heart from all natural weaknesses and attachments, made him to pass through the crucible by the most severe interior and exterior trials; which is his ordinary conduct toward those souls which he prepares to raise to an eminent sanctity, and to enrich with his extraordinary graces. He had no sooner recovered his liberty but he was made superior of the little convent of Calvary, situate in a desert, and, in 1579, founded that of Baëza. In 1581, he was chosen prior of Granada; in 1585, vicar-provincial of Andalusia; and, in 1588, first definitor of the Order. He founded at the same time the convent of Segovia. In all his employments, the austerities which he practised seemed to exceed bounds; and he only slept two or three hours in a night, employing the rest in prayer, in presence of the blessed sacrament. He showed always the most sincere and profound humility, and even love of abjection, an inimitable fervour and zeal for all the exercises of religion, and an insatiable desire of suffering. He used to say, “To suffer for the sake of God is the true characteristic of his love, as we see in Christ and in the martyrs. And persecutions are the means to enter into the depth, or attain to the knowledge, of the mystery of the cross, a necessary condition for comprehending the depth of the wisdom of God, and of his love.” Hearing Christ once say to him, “John, what recompense dost thou ask of thy labours?” He answered, “Lord, I ask no other recompense than to suffer and be condemned for thy love.” At the very name of the cross he fell into an ecstacy, in the presence of mother Anne of Jesus. Three things he frequently asked of God: 1st, That he might not pass one day of his life without suffering something; 2ndly, That he might not die superior; 3rdly, That he might end his life in humiliation, disgrace, and contempt. The very name of the sufferings of Christ, or sight of a crucifix, threw him into raptures of sweet love, and made him melt in tears. The passion of our Redeemer was the usual subject of his meditations, and ho exceedingly recommends the same to others in his writings. He was frequently so absorbed in God that he was obliged often to offer violence to himself to treat of temporal affairs, and sometimes, when called out from prayer, was incapable of doing it. Coming to himself from sudden raptures, he would cry out with words, as it were of fire. “Let us take wing and fly on high. What do we do here, dear brethren? Let us go to eternal life.” This love appeared in a certain brightness which darted from his countenance on many occasions, especially when he came from the altar or from prayer. A person of distinction was one day so moved with the sight of it, perceiving the heavenly light of his face to dazzle his eyes, and pierce his heart with divine love, that on the spot he took a resolution to renounce the world, and embraced the Order of St. Dominick. A lady coming to confession to him was so struck with a heavenly light which shone from his countenance and penetrated her soul, that she immediately laid aside her jewels and gaudy attire, and consecrated herself to God in strict retirement, to the astonishment of the whole city of Segovia. His heart seemed an immense fire of love (to use his expression in his Flame of Divine Love), which could not contain itself within his breast, but showed itself by these exterior marks. His love of his neighbour was no less wonderful, especially towards the poor, the sick, and sinners; his continual tenderness and affection for his enemies, and the benefactions and kindness with which he always studied to return good for evil, were most admirable. For fear of contracting any attachments to earthly things, he was a rigorous observer and lover of poverty. All the furniture of his little cell or chamber consisted in a paper image and a cross made of rushes, and he would have the meanest beads and breviary, and wear the most threadbare habit he could get. A profound sentiment of religion made him bear an extreme respect to whatever be longed, even remotely, to churches, or to the service of God. The same motive of the honour of God sanctified all his actions. He employed many hours every day and night in prayer, and often before the blessed sacrament, with extraordinary fervour. True devotion he described to be humble, not loving to be lofty; silent, not active; without attachment to anything; without singularity or presumption; full of distrust in itself; following with ardour simple and common rules. In 1591, the chapter of his Order met at Madrid, in which St. John opposed too severe measures used in the punishment of disobedience against Father Gratian, who had been a great assistant to St. Teresa; and likewise strenuously spoke against a motion supported by some of the chiefs, for casting off the direction of the Teresian nuns. This gave offence to some whom envy and jealousy had indisposed against him, and by their means the servant of God was thrust out of all employments in his Order. It was with joy that he saw himself in disgrace and at liberty, and retired into the little solitary convent of Pegnuela, in the mountains of Sierra Morena. St. John, living in the practice of extreme austerities, and in continual contemplation, fell sick, and when he could no longer conceal his distemper, the provincial ordered him to leave Pegnuela, that place being destitute of all relief, and gave him the choice either to go to Baëza or to Ubeda. The first was a very convenient convent, and had for prior an intimate friend of the saint. The other was poor, and F. Franois Chrysostom was prior there, the other person whom he had formerly corrected, and who was no less his enemy than F. Diego. The love of suffering made St. John prefer this house of Ubeda. The fatigue of his journey had caused his leg to swell exceedingly, and it burst in many places from the heel quite to the knee, besides five ulcers or wounds under his foot. He suffered excessive pains from the violence of the inflammation, and from the frequent incisions and operations of the surgeons, from the top to the bottom of his leg. His fever all this time allowed him no rest. These racking pains he suffered three whole months with admirable patience, in continual peace, tranquillity, and joy, never making the least complaint, but often embracing the crucifix, and pressing it close upon his breast when the pain was very sharp. The unworthy prior treated him with the utmost inhumanity, forbade any one to be admitted to see him, changed the infirmarian because he served him with tenderness, locked him up in a little cell, made him continual harsh reproaches, and would not allow anything but the hardest bread and food, refusing him even what seculars sent in for him; all which the saint suffered with joy in his countenance. God himself was pleased to complete his sacrifice, and abandoned him for some time to a great spiritual dryness, and a state of interior desolation. But his love and patience were the more heroic. God likewise stretched out his hand to bring the dove into the ark when she seemed almost sinking in the waters, overwhelming his chaste soul again with the torrent of his delights with which he so often strengthened the martyrs, converting their torments into pleasures. The provincial happening to come to Ubeda a few days before his death, was grieved to see this barbarous usage, opened the door of his cell, and said, that such an example of invincible patience and virtue ought to be public, not only to his religious brethren, but to the whole world. The prior of Ubeda opened his eyes, begged the saint's pardon, received his instructions for the government of his community, and afterwards accused and condemned himself with many tears. As for the saint himself, we cannot give a better description of the situation of his holy soul in his last moments than in his own words, where he speaks of the death of a saint, “Perfect love of God makes death welcome, and most sweet to a soul. They who love thus, die with burning ardours and impetuous flights, through the vehemence of their desires of mounting up to their beloved. The rivers of love in the heart, now swell almost beyond all bounds, being just going to enter the ocean of love. So vast and so serene are they that they seem even now calm seas, and the soul overflows with torrents of joy, upon the point of entering into the full possession of God. She seems already to behold that glory, and all things in her seem already turned into love, seeing there remains no other separation than a thin web, the prison of the body being almost broken.” Though the Holy Ghost varies his operations and gifts in his servants, this seems the exact portraiture of the soul of our saint upon the point of leaving this world. Two hours before he died he repeated aloud the Miserere psalm with his brethren; then he desired one to read to him part of the book of Canticles, appearing himself in transports of joy. He at length cried out, “Glory be to God;” pressed the crucifix on his breast, and after some time said, “Lord, into thy hands I commend my soul;” with which words he calmly breathed forth his soul on the 14th of December, in 1591, being forty-nine years old, of which he had spent twenty-eight in a religious state. Almighty God exalted him after his death by several miracles; amongst which the cure of a nun of the Annunciation, at Neuf-Chateau, in Lorrain, struck with a palsy, in 1705, effected on the ninth day of a Novena of devotion to this saint, was juridically proved in the court of the Bishop of Toul. St. John was canonized by Benedict XIII, in 1726, and his office in the Roman Breviary was appointed on this 24th of November. His body remains at Segovia. A history of his revelations, and many miracles, with an exact account of his writings, and mystical theology, may be read in his life by F. Dositheus of Alexis. The spirit of Christianity is the spirit of the cross. To attain to, and to live by pure love, we must live and die upon the cross, or at least in the spirit of the cross. Jesus merited all the graces we receive by suffering for us; and it is by suffering with him that we are best prepared to be enriched with them. Hence afflictions are part of the portion which, together with the hundred-fold of his consolations, he has promised to his most beloved servants. His most holy and innocent mother bore a large share in all his sufferings. His apostles and other most faithful servants, in proportion to the high degree in which they stood in his favour, drank of this cup. Those souls which he has raised to the highest degree of familiarity in this life, he always prepared for that grace by severe trials. But in the divine love they found a recompense, which richly paid them for all its cost, this love being its own present reward, as it is a fire which is its own fuel. The Divine Office for the use of the Laity, Volume II, 1806. Also Read – November 24, 2018: St. Chrysogonus, Martyr. St. John of the Cross, pray for us.